Makeup, Clothes, Bath Stuff, Yarn, Food … Basically, Colorful Things That Smell Good. Maybe that’s actually a trip alert! You know, triplicate? Instead of duplicate? The point is, I have discovered that I own not one, not two, but THREE versions of what is essentially the same eyeshadow shade. And whether you like higher-end makeup, drugstore cheapies, or online-only mineral makeup, there’s one here for you! The shade in question is a very pale matte beige. In my case, you might even call it a “my lids but better” shade. It’s light and matte enough that you can tell I’m wearing SOMETHING, but subtle enough to be barely noticeable. It makes an excellent, warmish highlight color and a perfect pale background for pinup-style eyeliner. And it might even make a reasonable “in a pinch” concealer or highlighter for the right skin tone. 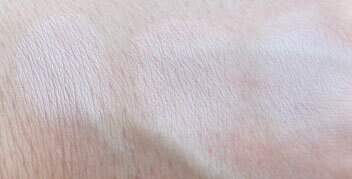 Here are swatches of the shade in question. On the left we have MAC Blanc Type. I was super excited when I ordered this (it was my first MAC purchase, along with the Vanilla and Naked pigments). My excitement sank into mild disappointment and then vague irritation with myself when I discovered that it’s basically the same color as Wet ‘n’ Wild Color Icon eyeshadown in Brulee (center), which I already owned. And then, when I hauled out and swatched all my Silk Naturals colors a week or so ago, I thought to myself, hmmm … that Bone eyeshadow looks mighty familiar. Yep. That’s it there on the right. In my opinion, Blanc Type and Bone are basically indistinguishable from each other. Brulee is very, very slightly warmer and darker than the other two; it’s also very soft, and I find it easier to get on my brush than Blanc Type. But those are basically the only differences, as far as I can tell. I’ve worn all three of these and have noticed no discernible differences in staying power. I’m (obviously) a huge fan of this shade, so it’s somewhat comforting to know that I will NEVER EVER run out of it. If you are intrigued by it but don’t have any of these, I say, just pick your poison. Like MAC? You need Blanc Type. Like $2 makeup? Brulee will scratch your pale beige itch on the cheap. Like excellent customer service and buying little pots of powder online? I recommend Bone. Have at it. That’s pretty funny. I think it is definitely true that you can find most shades (especially neutrals or more common shades) in other lines that are just as good as the expensive stuff. And it’s really just what you prefer! I really don’t see any difference, either! Yeah, no sense in paying $14 for an eyeshadow if I can get the same thing at Rite Aid for $2, you know? Ah, well then it sounds like your pale beige needs are met! Thanks for the comparison. I always like seeing dupe swatches so I know which colors I don’t need to get. However, I don’t think I have any of these three colors! If I did pick one up, I’d lean towards the Silk Naturals or WnW. I actually don’t own any MAC! I own very little MAC myself–couple of pigments, couple of eyeshadows, couple of brushes. IMO, the brushes are totally worth the money. I do have a hard time justifying spending that much on a single eyeshadow these days, though. Thanks for saving me from someday probably buying Blanc Type! I have all of the Color Icon palettes… I love finding dupes for things, especially if it means saving money (which means I can buy MORE makeup). I ❤ dupes also. The dupe list is probably my favorite thing about Temptalia.